Linking verb connects a subject and other part of sentence like noun or adjective. 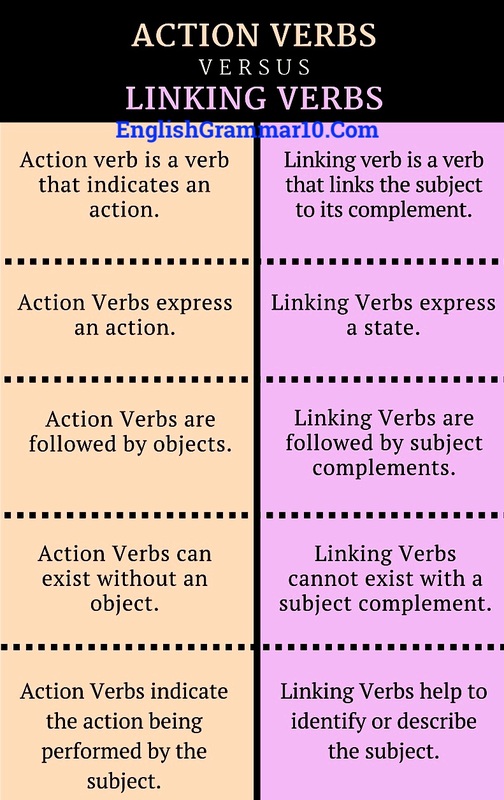 The main work of linking verb is established a connection between subject with noun or adjective. The most common linking verbs are forms of the verb to be: am, is, are, was, were, being, been, and Other common linking verbs include appear, become, feel, grow, look, remain, seem, smell, sound, stay, taste, and turn. Action: He accepted my apology. Linking: The child will be tall five years from now. The ghost appeared in the doorway. Bill became the president of the student council. The tree grows every day. John felt sick after lunch. The cloth on the table felt soft and fuzzy. Roberto placed the ball into the corner of the goal. Georgia is a state just above Florida. Before leaving for school, Andrea helped her mother pack their lunches. Those cars are the most expensive ones on the lot.